මෙම 1978 සිතියමින් ඉන්‍දු-ආර්ය භාෂාවල භූගෝලීය පැතිරීම පෙන්‍වයි. (උර්දු හින්‍දි යටතේ දක්වා ඇත. රෝමානි, දොමාරි, හා ලොමාව්‍රෙන් මෙම සිතියමේ අන්තර්‍ගත නැත.) තිත්/ඉරි ප්‍රදේශ බහුභාෂිකත්වය සාමාන්‍ය වන පෙදෙස් ය. ඉන්‍දු-අාර්ය හෙවත් ඉන්‍දු භාෂා යනුඉන්‍දීය අර්‍ධද්‍වීපයේ ප්‍රමුඛ ම භාෂා පවුල යි. මේවා ඉන්‍දු-යුරෝපීය භාෂා පවුලේ ඉන්‍දු-ඉරානීය භාෂාවල ශාඛාවකි. බිලියන 3ක් පමණ වූ ඉන්දු-යුරෝපීය බස් වහරන්නන්ගෙන් බිලියන 1.5ක් ම පමණ ඉන්දු-ආර්ය කථිකයෝ ය. මෙබස් ප්‍රධාන වශයෙන් දකුණු ආසියාවේ බැවහැරුණ ද යුරෝපයේ සහ මැද පෙරදිග ද සුළු වශයෙන් සොයාගත හැක. කථික සංඛ්‍යාවෙන් විශාලතම බස් පිළිවෙලින් හින්දුස්ථානී (හින්දි-උර්දු, මිලියන 329ක් පමණ), බෙංගාලි (මිලියන 242), පංජාබි (මිලියන 100ක් පමණ), ඉන්පසු අනෙක් බස්, 2005 ඇස්තමේන්තුවට අනුව මුලු දේශීය කථික ප්‍රජාව මිලියන 900ට ආසන්න වෙයි. ප්‍රාග්-ඉන්දු-ආර්ය, හෝ යම්විටෙක ප්‍රාග්-ඉන්දීය ලෙස හඳුන්වන්නේ ඉන්දු ආර්ය භාෂාවල නැවත ගොඩනැඟූ ප්‍රාග්-භාෂාව යි. ඒ ප්‍රාග්-ඉන්දු ආර්යයන්ගේ බස යළි ගොඩනැඟුම සඳහා ය. ප්‍රාග්-ඉන්දු-ආර්ය බස පුරාතන ඉන්‍දු-ආර්ය (ක්‍රි.පූ.1500–300) වෛදික සහ මිතන්නි-ආර්ය භාෂාවල මුතුන්මිත්තා ලෙස ගතහැක. වෛදික බසෙහි පොරණ සැලකිය යුතුමුත්, වෛදික බසින් තුරන්වී ගිය යම් පෞරාණික ලක්‍ෂණ අන් ඉන්‍දු-ආර්ය භාෂාවල ඇත. The earliest evidence of the group is from Vedic and Mitanni-Aryan. Vedic has been used in the ancient preserved religious hymns, the foundational canon of Hinduism known as the Vedas. Mitanni-Aryan is of similar age to the language of the Rigveda, but the only evidence of it is a few proper names and specialized loanwords. The language of the Vedas - commonly referred to as "Vedic Sanskrit" by modern scholars - is only marginally different from reconstructed Proto-Indo-Aryan. From the Vedic, "Sanskrit" (literally "put together", meaning perfected or elaborated) developed as the prestige language of culture, science and religion, as well as the court, theatre, etc. Sanskrit is, by convention, referred to by modern scholars as 'Classical Sanskrit' in contradistinction to the so-called 'Vedic Sanskrit', which is largely intelligible to Sanskrit speakers. The Indo-Aryan languages of Northern India and Pakistan form a dialect continuum. 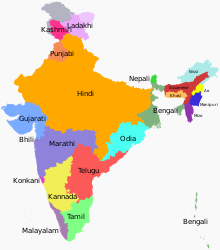 What is called "Hindi" in India is frequently Standard Hindi, the Sanskrit-ized version of the colloquial Hindustani spoken in the Delhi area since the Mughals. However, the term Hindi is also used for most of the central Indic dialects from Bihar to Rajasthan. The Indo-Aryan prakrits also gave rise to languages like Sindhi, Gujarati, Assamese, Bengali, Odia, Nepali, Marathi, and Punjabi, which are not considered to be part of this dialect continuum. The Romani language is usually included in the Western Indo-Aryan languages. Romani — spoken mainly in various parts of Europe — is conservative in maintaining almost intact the Middle Indo-Aryan present-tense person concord markers, and in maintaining consonantal endings for nominal case – both features that have been eroded in most other modern languages of Central India. It shares an innovative pattern of past-tense person concord with the languages of the Northwest, such as Kashmiri and Shina. This is believed to be further proof that Romani originated in the Central region, then migrated to the Northwest. මෙම වර්ගීකරණය Masica (1991) හා Kausen (2006)ට අනුව ය. ↑ "världens-100-största-språk-2010". Nationalencyclopedin. Govt. of Sweden publication. සම්ප්‍රවේශය 30 August 2013. ↑ Edwin Francis Bryant; Laurie L. Patton (2005). The Indo-Aryan Controversy: Evidence and Inference in Indian History. Routledge. පිටු 246–247. ISBN 978-0-7007-1463-6. https://books.google.com/books?id=fHYnGde4BS4C. ↑ Kulshreshtha, Manisha; Mathur, Ramkumar (24 March 2012). Dialect Accent Features for Establishing Speaker Identity: A Case Study. Springer Science & Business Media. පි. 16. ISBN 978-1-4614-1137-6. https://books.google.com/books?id=xHmARyhRoNYC&pg=PA16. ↑ Robert E. Nunley; Severin M. Roberts; George W. Wubrick; Daniel L. Roy (1999), The Cultural Landscape an Introduction to Human Geography, Prentice Hall, ISBN 0-13-080180-1, https://books.google.com/?id=7wQAOGMJOqIC, "... Hindustani is the basis for both languages ..."
↑ "Urdu and its Contribution to Secular Values". South Asian Voice. Archived from the original on 11 November 2007. සම්ප්‍රවේශය 26 February 2008. ↑ "Hindi/Urdu Language Instruction". University of California, Davis. Archived from the original on 3 January 2015. සම්ප්‍රවේශය 3 January 2015. ↑ "Ethnologue Report for Hindi". Ethnologue. සම්ප්‍රවේශය 26 February 2008. ↑ "History of the Romani language". ↑ "Romani (subgroup)". SIL International. n.d. සම්ප්‍රවේශය September 15, 2013. ↑ "Report of the Commissioner for linguistic minorities: 50th report (July 2012 to June 2013)" (PDF). Commissioner for Linguistic Minorities, Ministry of Minority Affairs, Government of India. Archived from the original (PDF) on 8 July 2016. සම්ප්‍රවේශය 17 September 2016. ↑ Ray, Tapas S. (2007). "Chapter Eleven: "Oriya". In Jain, Danesh; Cardona, George. The Indo-Aryan Languages. Routledge. p. 445. ISBN 978-1-135-79711-9. ↑ Nordhoff, Sebastian; Hammarström, Harald; Forkel, Robert et al., eds (2013). "Kuswaric". Glottolog 2.2. Leipzig: Max Planck Institute for Evolutionary Anthropology. http://glottolog.org/resource/languoid/id/kusw1234. ↑ Nordhoff, Sebastian; Hammarström, Harald; Forkel, Robert et al., eds (2013). "Chinali–Lahul Lohar". Glottolog 2.2. Leipzig: Max Planck Institute for Evolutionary Anthropology. http://glottolog.org/resource/languoid/id/chin1491. Cardona, George; Jain, Dhanesh, eds. (2003), The Indo-Aryan Languages, Routledge, ISBN 978-0-415-77294-5, https://books.google.com/books?id=jPR2OlbTbdkC&printsec=frontcover&dq=indo-aryan+languages . Masica, Colin (1991), The Indo-Aryan Languages, Cambridge: Cambridge University Press, ISBN 978-0-521-29944-2, https://books.google.com/books?id=J3RSHWePhXwC&printsec=frontcover&dq=indo-aryan+languages . මේ පිටුව අන්තිමට සැකසුවේ 11 ජනවාරි 2018 දින දී, 18:58 වේලාවෙහිදීය.